ABC Signs strives to provide its employees with a safe working environment. This responsibility carries over to our installation sites as well. 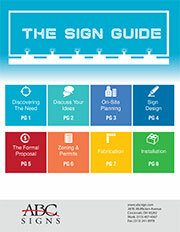 All ABC Sign crews receive OSHA safety training and are compliant with the appropriate OSHA standards and guidelines. You can be sure that your sign will be installed by certified professionals who value safety above all else. Please call (513) 407-4367 or email us to get started on your sign installation today!